On 12 March 2015 Cem Özdemir visited the Armenian Genocide memorial in Yerevan, Armenia and declared his formal recognition of the Armenian Genocide and called on Turkey to recognize it as well. “I think that Germany should obviously refer to the Armenian Genocide issue. As a friend of two countries, we should help to open the Armenian-Turkish border. As a friend of both countries, we should exert effort, so that the Armenian-Turkish relations become like the French-German or Polish-German relations.”, he stated. In 2016 Özdemir initiated a resolution in the Bundestag that would formally classify the 1915 massacres as genocide. The resolution passed on 2 June 2016 with what Speaker Norbert Lammert called a “remarkable majority.” At the time, Özdemir emphasized that the resolution was not designed to point fingers at others but rather to acknowledge Germany’s partial responsibility for the genocide. In 1915, the German Empire was a close ally of the Ottoman Empire but decided not to condemn the violence nor to intervene in any other way. Thus, the Board of the Raoul Wallenberg Foundation has unanimously resolved to grant the award to the politician of Turkish extraction for the pivotal role he has played in the presentation of the Bundestag Genocide Bill. 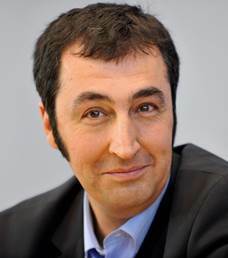 Cem Özdemir is a German politician. Since 2008 he is co-chairman of the German political party Alliance ’90/The Greens. He is a Member of the German Bundestag since 2013 and he was a Member of the German Bundestag between 1994 and 2002 and of the European Parliament between 2004 and 2009. The Raoul Wallenberg Foundation construes his words as a gesture of reconciliation which will build bridges between Turks and Armenians and will preserve the blessed memory of the victims and the courageous rescuers who reached-out to the persecuted ones. The IRWF is fully devoted to preserving and spreading around the legacy of Raoul Wallenberg and his likes, namely, women and men who reached-out to the victims of the Holocaust, as well as other tragic chapters of human history, regardless of the religion, race and nationality of rescuers and survivors alike. More than 300 heads of state and government (former and incumbent), Nobel Prize laureates and distinguished personalities from all walks of life, religions and ethnicities, including Pope Francis, have joined the ranks of the Raoul Wallenberg Foundation, an educational NGO chaired by Eduardo Eurnekian and created by Baruch Tenembaum. One of the flagship programs of the IRWF is an in-depth research of the Muslim Turks and Kurds who reached-out to the Armenians from 1915 onwards. The same was carried-out in the field, under the strict academic supervision of Professor Taner Akcam, of Clarks University. The preliminary findings, which include the stories of over 180 rescuers, were published on the website as a free-download book, in Turkish, Armenian, English and Spanish.